Location: Located in a central position in the gardens at Margam Park, to the NE of the orangery. Robert of Gloucester, Earl of Glamorgan, granted lands for a Cistercian Abbey at Margam in 1147. Most of the nave of the original C12 abbey church survives and is now the parish church. The rest of the abbey church and the remaining monastic buildings were rebuilt in Early English style in the early C13, probably in 1203-13 under Abbot Gilbert. The chapter house belongs to the beginning of this phase and is a prime example of the Early English style. Its 12-sided form is rare in Cistercian architecture and the only comparable, but less well-preserved example is at Abbey Dore in Herefordshire. The chapter house was the administrative centre of Margam Abbey. The entrance vestibule is contemporary and was accessed from the cloisters to the W. However, one doorway adjoining the N side of the entrance vestibule is C12. The presbytery and transepts were rebuilt a few years after the chapter house, as shown by the difference in style. Their walls had to respect the new chapter house, and the arrangement between them is awkward. The S wall of the choir is later still, in Decorated style. 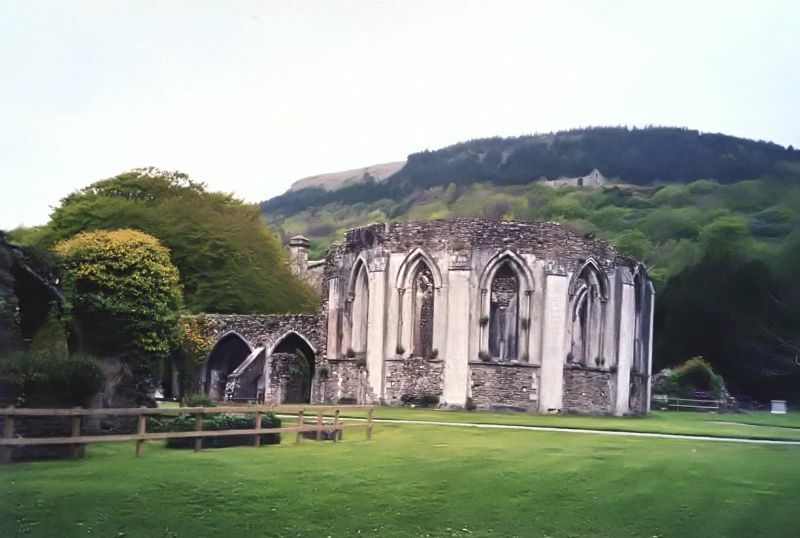 Margam Abbey was dissolved by the crown visitors of Henry VIII in 1536-7 and the monks evicted. By 1540, Sir Rice Mansel (1487-1859) of Oxwich and Old Beaupre had acquired most of the former monastic lands. He built an impressive Tudor house, incorporating some of the monastic remains into the service areas, but the chapter house was retained as a distinctive feature within the garden. A small low-level opening in the E side of the building is said to have been inserted at this time. In the later C18 the abbey remains were not viewed favourably: The chapter house was used as a coal store and the entrance vestibule as a brew-house. An engraving of 1780 shows the chapter house complete with its groined roof. Soon afterwards, Thomas Mansel Talbot stripped the lead from the roof and by 1787 the chapter house was in ruins. The Chapter-House was comprehensively conserved in early 1980s. Twelve-sided structure standing full height but roofles. Tall pointed arched windows to each side and entrance to W. Pronounced sill band, above which is dressed Sutton stone, continuing to the spandrels of the arches. Rubble stone above and below. Clasping buttresses of dressed stone to angles. Window openings with 2 orders of chamfered mouldings under hoodmoulds. The outer order are supported on circular shafts with central shaft rings, ringed bases, decorated capitals including stiff leaf, and square abaci (some fragments of the shafts are missing). At a low level to the E is a moulded circular opening. The W entrance to the Chapter House consists of a shallow pointed arched doorway with 2 orders of chamfered mouldings, and an impost band with filleted roll moulding, flanked by single light windows in the same style. The next faces round, to the N and S, are supported by large buttresses. The interior is circular and is dominated by a central pier. This is faced by 4 polygonal shafts, in between which are detached circular shafts with rings. The shafts have stiff-leaf capitals and ringed abaci which support a cluster of moulded rib fragments. Water holding bases. Between each window are 3 clustered circular shafts, supported on decorated corbels below the sill band. The shafts support the outer ends of the moulded vault ribs. Dressed stone blocks below corbels, probably to add strength. Small recesses in the lower-level rubble for supporting benches or stalls. Interior window openings as exterior with 2 orders of chamfered mouldings, but the bell capitals have varied decoration, including stiff-leaf, foliage, scallops and fluting. The small opening at low level in the E wall is in the form of a splayed quatrefoil in a square moulded frame. The window above has fluted moulding to the outer order of the arch, suggesting that the abbot may have sat here. The Chapter House has a vaulted entrance vestibule to its W which is also the undercroft to a demolished dormitory. The vestibule is 2-bays deep from E-W and 3-bays deep from N-S, with wider central bay. Quadripartite rib-vaults on corbels. The N and S sides have wide pointed arches with chamfered dressings and flying buttresses against the central octagonal piers. Triple entrance to W consisting of a highly ornate central archway flanked by smaller arches. The central pointed arch has 3 orders of keeled roll mouldings which spring from detached circular shafts with shaft ring, ringed base and scalloped or foliate bell capitals. Dog-tooth decoration to central order. Narrower shafts to jambs of doorway with decorated bell capitals. The flanking doorways are similar but with 2 orders of shafts and roll mouldings. Large flying buttresses are built against the spandrels of the arches. An earlier rubble wall adjoins to the N and has a segmental arched entrance in Norman style. This has 3 orders of roll mouldings to the exterior (W) side and has a plain voussoir head to the interior. A wall also continues to the S, with a chamfered arched doorway. To its R is a smaller doorway in the same style. Beyond the E side of this wall is a line of polygonal column bases which would have supported the dormitory over, a continuation of the vestibule undercroft. Ruined remains of the former abbey church survive to the N of the Chapter House. These include parts of the walls of the S transept, the S walls of the presbytery and choir, and 3 pier bases. The largest base supported the SE pier of the crossing: Irregular plan with square wall stub to W and polygonal faces to E, N and S, with attached and detached circular shafts on ringed bases. The smaller bases are aligned along the S transept and formed the boundary to a chapel along its E side. They are square and set diagonally with circular shafts on ringed bases at the angles and at the mid-points between. The S wall of the choir is a free-standing fragment in Decorated style. It contains 2 arches in a square-headed dressed stone panel. The doorway to the R, which led to the cloisters, has pronounced continuous mouldings. Blind recessed arch to L with trefoiled head. The spandrels of the arches contain trefoils in relief. An arch fragment springs from the W end of the wall but is not in a dressed surround. On the N interior side is an attached shaft with ringed base, and a roll moulding which runs across the wall. The S wall of the presbytery is continued by the E and S sides of the transept. It stands to a considerable height with tall pointed arched windows containing plate tracery with 2 lancets and a quatrefoil. Hoodmoulds to each side, and circular shafts against jambs on interior side (mainly missing). The interior side also has full height attached shafts between the windows. At the angle of the presbytery and transept is a cluster of triple shafts supporting moulded rib fragments. One window survives to the presbytery, beyond which the wall continues at a lower level with the remains of a narrow doorway with 2 orders of mouldings. Exterior buttresses on chamfered plinths. Two windows in E side of transept light a chapel on a raised platform. The S wall survives below sill band level and contains 2 recesses: A scalloped projecting piscina to L within a square moulded frame. A fragment of an arched aumbry survives to the R. The wall turns at right angles and joins the Chapter House to the S in an uncomfortable arrangement. It contains a doorway with segmental head of narrow voussoirs which leads into a triangular recess, above which is a partially blocked window. Listed grade I as the only 12-sided Cistercian Chapter House in Wales, and the best surviving of its type in Britain. A very fine example of the Early English style. The associated monastic remains are of additonal interest. Scheduled Ancient Monument GM005 (NEP). Located near the W end of the broadwalk, E of the orangery and chapter house. The broadwalk rises up to the E with Margam Castle as the focal point. The centre-piece in the gardens at Margam Park. The abbey remains are immediately to the NE, with the broadwalk leading up to Margam Castle further E.